This entry was posted on Friday, June 11th, 2010 at 4:22 pm	and is filed under General. You can follow any responses to this entry through the RSS 2.0 feed. You can leave a response, or trackback from your own site. I am not sure what kind of witch I am. I never really thought about it. I always did spells whenever I needed them like headache spells or healing spells. Anyhow, that being said, I’ve always found the terms “white” and “dark” or “black” so … distasteful. I’ve always considered witches like nature, neither black nor white, but neutral. Each person has it in them to do right and wrong, and it’s up to them to control themselves. How they use their magic follows suit. Does that make sense? 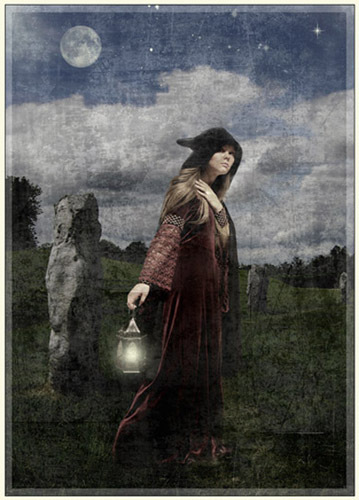 As to what kind of path one takes, Pagan, Druidism, Wiccan, Native American, etc… I think that can define how you use your magic just as much, maybe better, than the question of ‘what kind of witch are you’. Then again, I think that’s the same question, just in a different light. I currently walk the path of a Wiccan. Though I’m ever learning, I would tell Glenda that “I’m a Good Witch”. As with you Crystal, I to had to explain myself to one who needed further explaining and in trying to do so it too became confusing for this individual.I am an eclectic, pagan, wiccan, solitary white witch. I do follow the wiccan rede-”three fold law-’an harm none” and practice that very seriously. To have to explain what your deepest most inner magic is all about is so hard without experiencing it for themselves let alone how sacred it is to tell them so. Magic is magic within itself. I have recently been called eclectic. In truth I am genetically Romani/Strega, but it goes so much deeper than that. I walk a path prepared by one who goes silently by and whose magick I share. We are one, but two. Twin flames who work solitary and whose path has been laid in prophecy and throughout time. I’m not sure I can be considered a witch at all. I am a ceremonial magician originally, but I draw techniques and inspiration from any and every source that seems to have something to offer. Lately, I’ve been getting excellent results from chaos magick. And I’ve been setting up as a Tarot reader. really i have no clue as to what kind of witch i may be or how to call my untapped potential power but something is definiteluy here…please help! Ahh the infamous question, I am a Hedge Witch we are eclectic and usually choose to remain solitary for many reasons. i live one foot in this world and one foot in another, i always have since i was a kid. I spend alot of time helping” others” who need or ask for it. I do live at the “Hedge” so to speak i spend alot of time in nature and listen and watch for the signs. Good or Bad Witches well its up to the person to seek what they desire and how they choose to achieve it. im not sure what witch i am? help me! I guess what i practice is called Chaos Magick to some due to use of inner temple, all started about 3 years ago through simple meditation techniques for health reasons and as i became a great believer of inner self healing something started to develop with in me then came the Crystal Healing, Tarot and Reiki wow i found something that really interested me and hidden talents. I just started, and have no idea what kind I am. you I will only do the right thing with this knowledge. well im a kid almost teenager so preteen and im a warlock i started doing magick last year when i looked it up to see if it was real it was. i was a great magic tricks guy my whole life, but this is better. i started with kids spells and felt as if i were already safer. so i would say i would be in the middle because i do white magick but i have a talent of reading minds and seeing the future so its hard. oh yeah crystal does a good imagination help a warlock like me. also im still a child so i could use some tips and spells from you please. i know that magick is for good and thats what i want to do with it since i am a christ believer. so please if you could e-mail me some spells and pointers that would be great.